Falkland 85 is pictured on the left. The Falkland lamp is now available in three sizes! Check the bottom of this page for all other size options. The Falkland lamp was designed by Bruno Munari in 1964 for Danese Milano, Italy. The Falkland lamp has become one of the classic icons of 20th Century Design and can be found in museum collections worldwide. Bruno Munari's Falkland lamp is available in three different sizes. The Falkland Classic measures 65" in height. The Falkland 85 measures 33.50" in height. The Falkland 53 measures 21" in height. 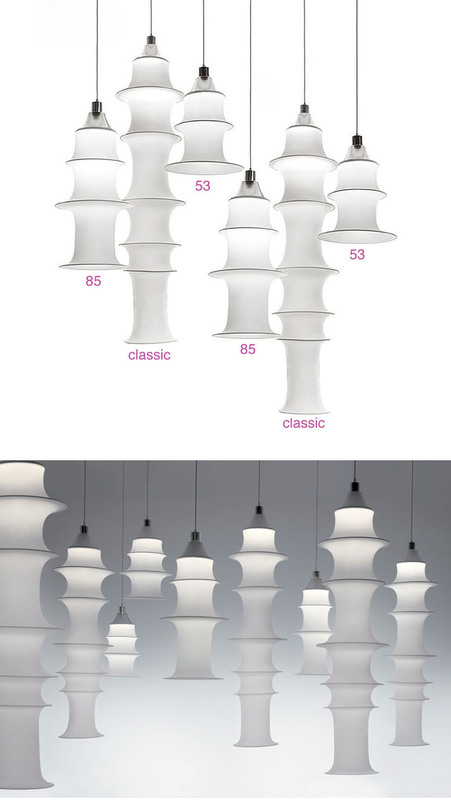 These different sized Falkland lamps make it possible to create a unique modern lighting landscape. Bruno Munari was born in Milan in 1907. When he was just twenty, he joined the second-generation Milanese Futurist Movement and began his eclectic activities in the fields of painting, design, educational and kinetic experimentation, graphic design, advertising and photography. His numerous personal exhibitions underlined his enormous creativity. Material: White tubular elastic fabric (fireproof) and aluminum.